Being a blogger, it’s useful to have the ability to highlight code in an article you are publishing so as someone can easily copy and paste out the example code for themselves if necessary. It also eliminates the annoying filtering a WYSIWYG editor creates. To enable code syntax highlighting in Joomla and to use with JCE editor follow these simple steps. 1. Download and install CipLogic's Code Editor Download the HTML version. 2. Install the ciplogic_mce_html_codeeditor_joomla_25_1.3.1.zip file to your Joomla back end. This installs a plugin. Make sure to enable the plugin Content - Code Highlighter (GeSHi) as well. 3. 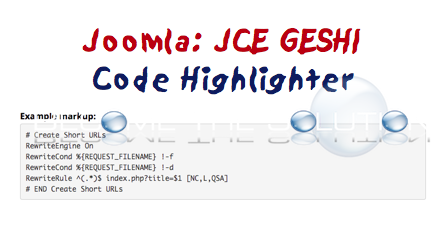 In your next Joomla article, you will need to add the special markup call to correctly highlight code in text. Here is an example.